Plantronics popular CS family is coming out with a new line to redefine the wireless standard – the CS500 series. The Plantronics CS520 features a new binaural (headband over-the-head covering both ears) headset design, streamlined base and improved performance, all with the same dependability for wireless productivity that has made the CS series a best seller. The Plantronics CS520 features a secure fitting headband for all day comfort weighting 92 grams, giving you up to 350 feet of range to roam your office, and a battery made to last all day with 9 hours of talk time. The Plantronics CS520 works best in an environment where you spend many hours per day talking and require a secure fitting headset. With both ears covered you will find yourself free from distractions in your office and you can fully concentrate on your caller. This is the biggest advantage of a binaural headset. Complete isolation! The soft leather ear cushions and premium sound quality will make short work of long phone conversations or conference calls. 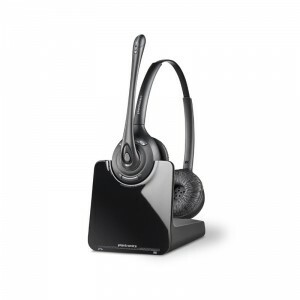 The Plantronics CS520 uses advanced wideband audio or CAT-iq technology that enables clearer conversations. It also uses an adaptive power system which optimizes the CS520 for the perfect balance between the 350 foot range and 9 hour talk time. This means you’ll never be cut short on a busy day because the battery needs charging. Another key feature of the Plantronics CS520 is the voice-dedicated DECT technology it uses which eliminates Wi-Fi interference so your call is crystal clear all the time. In summary the Plantronics CS520 wireless headset provides all day comfort, complete isolation and a noise canceling microphone so your calls are crisp, clear and your not wasting time asking for information to be repeated because of poor or low audio quality.